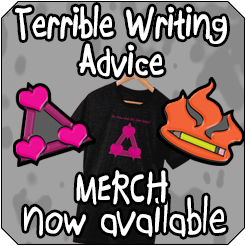 The Terrible Writing Advice Halloween Special is out! Now you too can learn to write a slasher film. Slasher films are a poor man’s monster movie. Sorry there isn’t more. I’m tired right now. I just got back from Fanboy Expo. Besides, no one actually reads these.